Home	/ Story of SVYM / (37) Help from an unexpected quarter! (37) Help from an unexpected quarter! It was October 1990. The construction of the Kenchanahalli hospital was in its final stages. We had run out of resources and things looked bleak. I was feeling very low and bereft of energy. I was sitting with Swami Achalanandaji and narrating the problems we had. He kept reassuring me that things would improve. He had a very simplistic way of looking at these things. His contention was that all good work would be supported and all that we needed to have was faith. His belief was that if social work were to be easy, everyone would be doing it. After a long discussion with him and following his customary advise of meditating in silence in the RIMSE meditation room (which is in the cellar), I started the journey back from Mysore to Brahmagiri. On the way, I stopped at Hotel Maharaja for dinner. As I sat alone waiting for the dinner to be served, an elderly gentleman in his late forties approached me and asked if he could speak to me. I was quite surprised and asked him why he wanted to do so. He told me that I looked very disturbed and pensive and he just felt like spending some time with me. As we spoke, he introduced himself as the owner of the hotel and told me that he was from Andhra Pradesh and that life was akin to his business, with ups and downs. He explained that the ‘ups’ in life would not be enjoyable if one did not have a referencing experience of the ‘downs’ and the resulting sadness. He noticed that I had come in the yellow Jeep parked outside and asked me if I was from Tamil Nadu as the Jeep carried the registration number of Tamil Nadu. I explained how the Shankaracharya of Kanchi had gifted the jeep to us. As soon as I told him this, his face lit up and he asked if the jeep was for sale. I was quite puzzled! He then explained that his family members were staunch devotees of the Shankaracharya and the Kanchi Math. He also told that his son-in-law was contesting elections in Andhra Pradesh and using the vehicle that had originally belonged to the pontiff would augur well for him and bring him good luck and the divine blessings that he needed to win. Things were happening so fast that I had negotiated the sale within the next 2-3 minutes and the jeep was sold. He very kindly told me that I could use the jeep to go back to Brahmagiri and bring it the next day and collect the money. 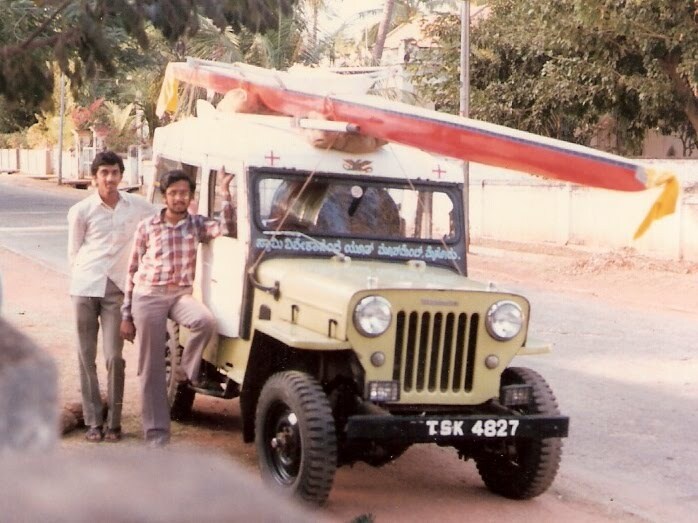 The jeep was sold for Rs.43,000 and that was nearly half the amount that we still needed to complete the hospital. Varadarajan had more than helped us in building the Kenchanahalli hospital. From getting it designed by his friend Advani to getting Nagaraj Rao of Technoart Constructions to donate substantially, to getting his own Alankar Painting Company to paint the hospital, he was with us all the way. I should also mention the support of the philanthropist Vijayam Krishnamurthi – the chairman of Vijayam Bharani Trust, who gave us all the fans required and that of Mysore Lamps, who donated all the light fittings required. So many hands were there to support us and I found my faith being restored and the energy returning. As Swami Achalanandaji always said, good work does have a way of finding support when it is needed! Next Article (38) All in a day’s work!